So, I've been trying to think of a suitable first post for my new blog and I suddenly thought of a little project that's sitting downstairs in the front room. 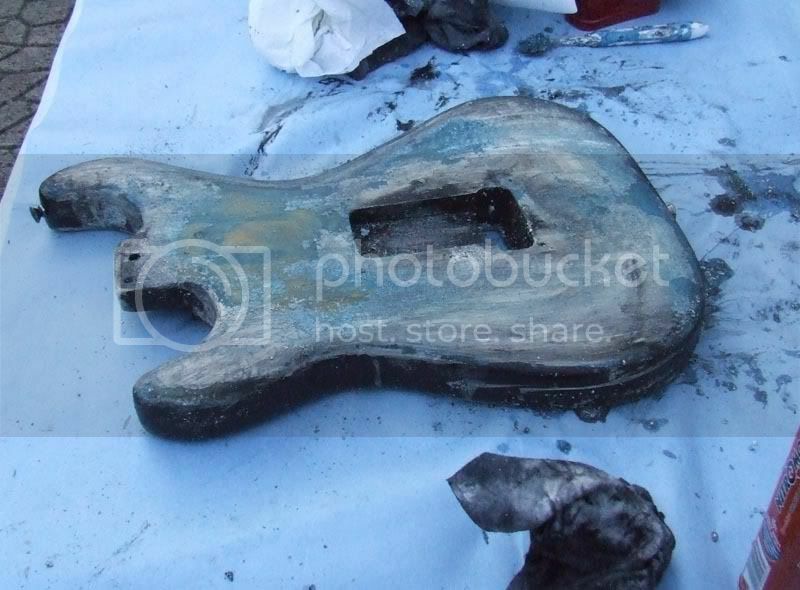 Back on the 17th of this month me and my other half, Jess for those who don't know, received a reply to a request we put on Freecycle (or more correctly Freegle as it's now called - stupid name) for damaged guitars or spare parts. 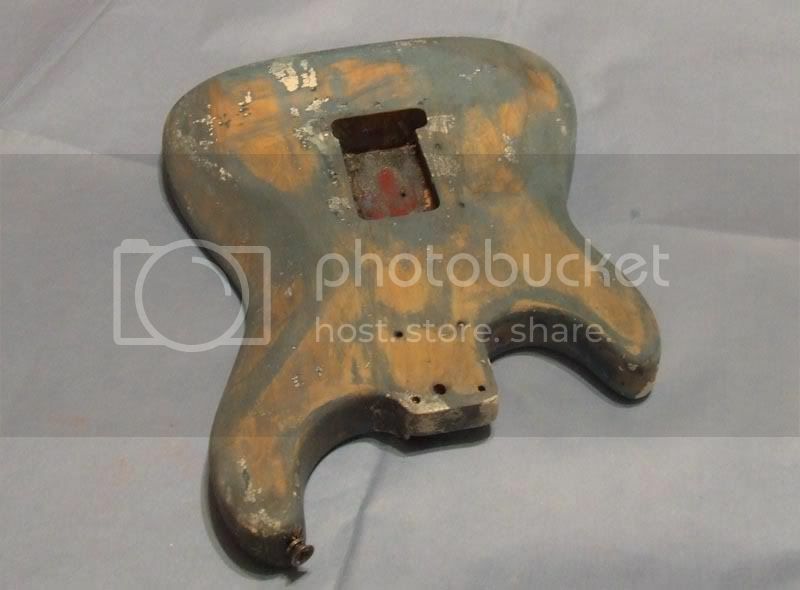 We have two guitars in need of some work and the wreck of an old Satelite bass that I want to turn into a new shinier, less plyboard bass guitar. 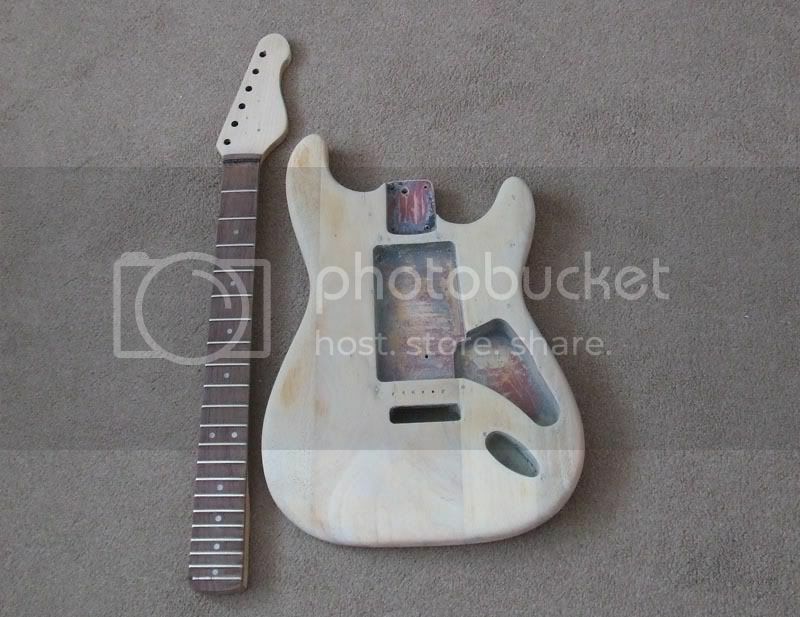 Basically I like the neck because it's standard guitar scale and I can't stretch my fingers far. 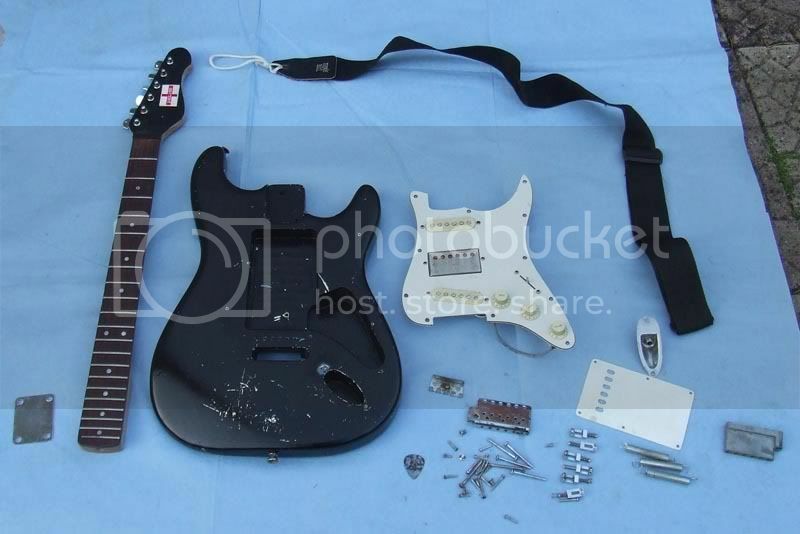 We were mostly hoping for some parts we could put towards one of those projects, but instead we got offered a (nearly) full guitar. The next day we picked up this lot, all loaded up in a quite nice but rather smelly gig bag. Trawling through images and specs of Strat clones and comparing the exact shape of the headstock we think it's either a Tokai or an Encore, or largely one of those anyway. The bag's had a trip through the washer and the guitar strap had three nice long soaks in the shower room sink, which eventually got the smell out, which backed up by the colour that came out of it, I believe to be the results of a very old beer spill. The previous owner had them for quite a while, an abandoned project of someone else, but hadn't got round to doing anything with it yet, so thought it was time to call it time and hand off to another someone else. As you can see below the wiring was a mess and was partially held together by sticky tape. 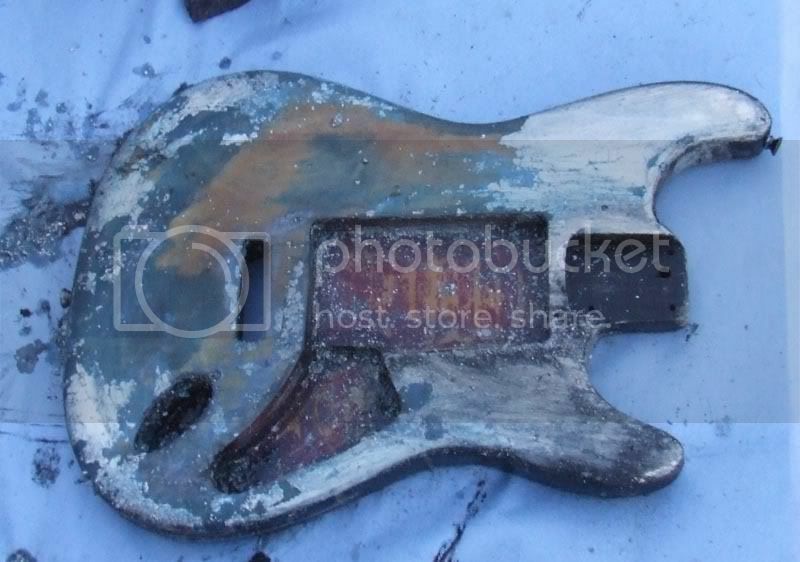 The centre pickup also turned out to be dead and not exactly what it seems. 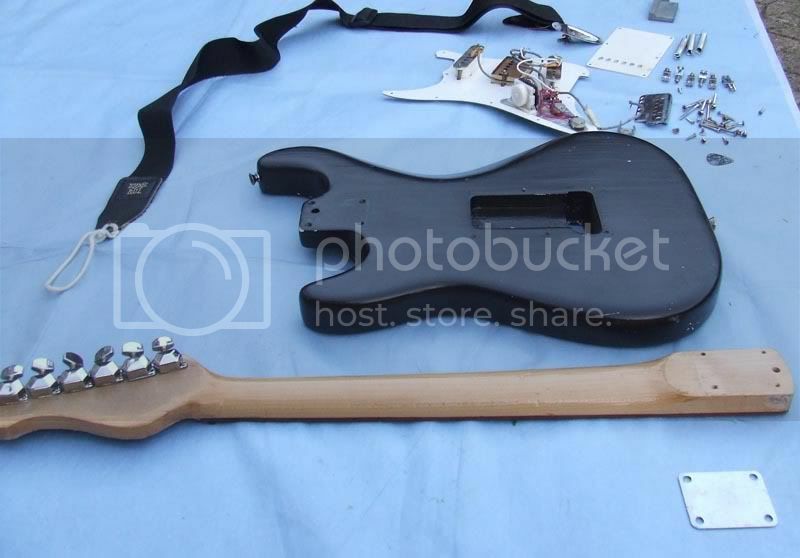 You see, that's not a twin coil humbucker in the middle, but a single coil pickup shoved into the twin coil's casing. Oh yes, and it's dead. The bridge is also damaged, but won't cause a problem unless you want to hook up a whammy bar, so although we will replace it, it isn't high priority right now as none of our guitars currently have one anyway. First thing to do (after going to the hardware store, realising our money was at home, going back to pick it up and then going back to the hardware store, oh and taking some photographs) was for us to head out into the garden with a blue sheet, some paint, varnish and lacquer remover, an old toothbrush and lots of dispoable cleaning cloths. It seems to have been repainted quite a few times. After that the body had a quick, and rather noxious, bath, was dried off and taken indoors because it was getting cold, dark and windy out. 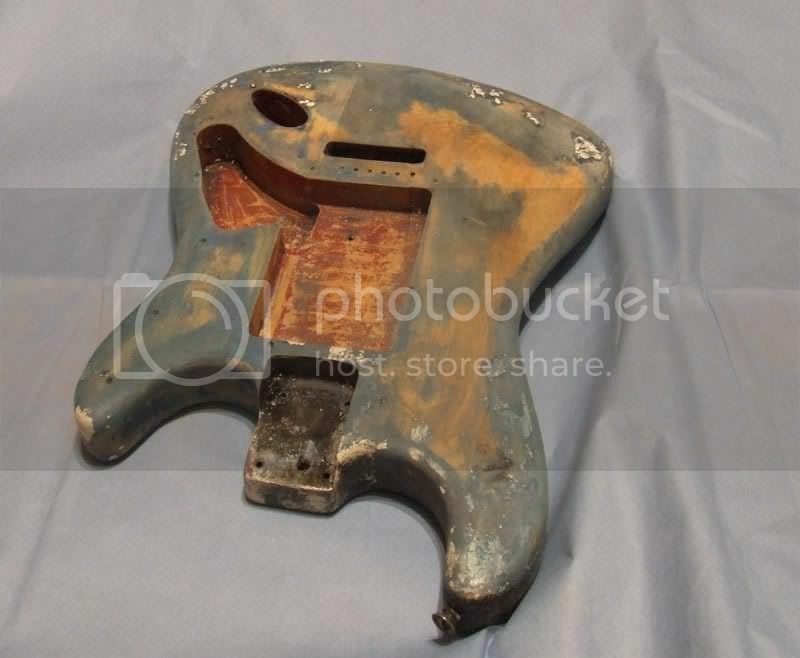 It now looks like a candidate for the next Fender "Relic" series. Next came five grades of sandpaper, scrubbing some gunk off the neck plate, disassembling and reassembling the machine heads to get them good and tight and then a good night's sleep. This is what she looked like the next morning having taken around six or seven hours and several cups of tea to get there. 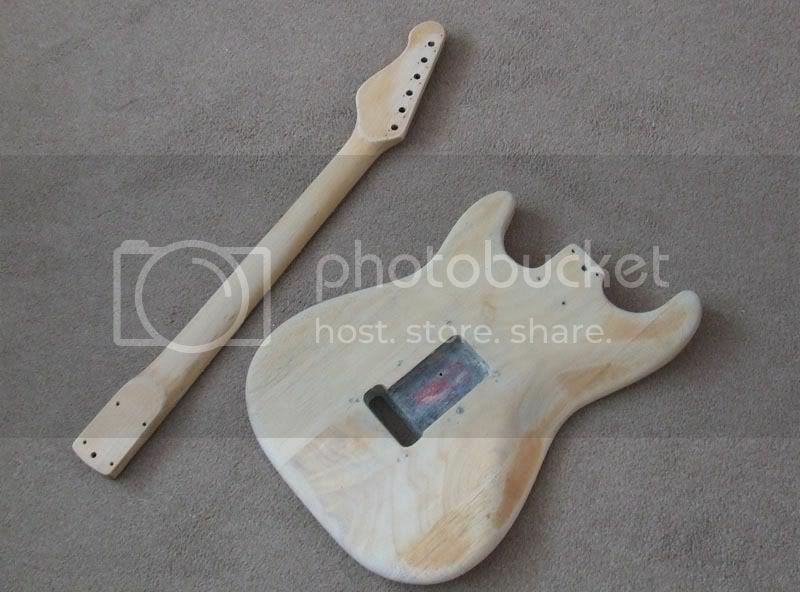 The body's going to get three more coats when we can hook up a good way of hanging it in order to get a nice even coating and the neck probably four. Before the last coat it's going to get a custom decal applied. 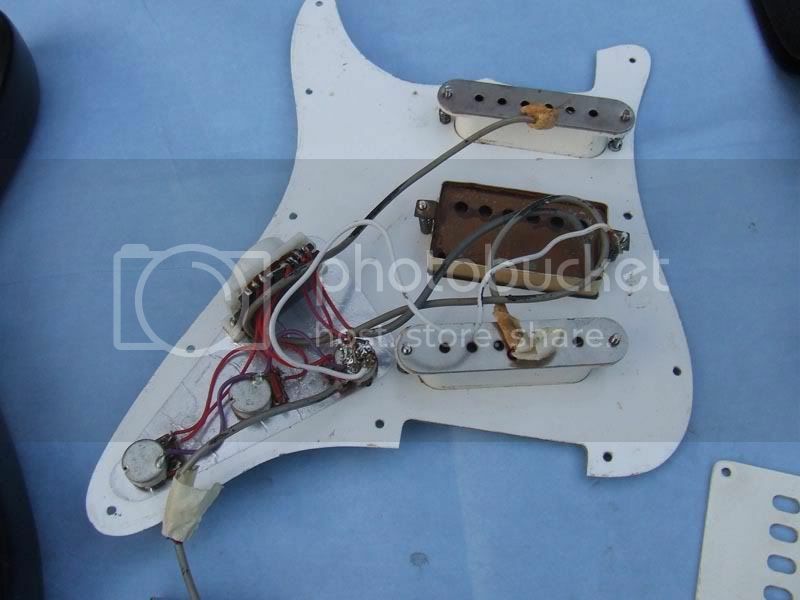 Due to the positioning of the humbucker, or the fake humbucker that we're going to replace with a real one, we've come up with some funky alternate wiring that requires a second switch installed, so it's really not going to be a Strat clone anymore, not truly anyway, so we've given it it's own custom model name, the JW-1. I quite like the effect of the chrome coloured casing with the natural looking body. With the black finish it looked a bit hack-ish to me. Well, it still looks a bit hackish I suppose, but now that comes with a bit of charm I think. Hopefully it won't be too long until we can get the parts to finish her off completely, but that might have to wait for a while yet with our money having lots of directions it needs to go out in.